I didn't appreciate the author referring to Southerner's as "traitors," and Jefferson Davis as, "the..
Perhaps somebody can explain the Gray Ghost set I bought years ago. This was one of my favorite show..
A real gem of a little book. 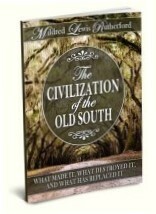 The author was witness to life before the Civil War and lived to write ..
We have to start somewhere, exposing the carpet baggers and scalawags of our day and resisting the w..
"Dixie Rising" is a pretty fitting slogan to put on a coffee mug in general, but that it's part of a..
"I shall arise" is a pretty fitting slogan to put on a coffee mug in general, but that it's part of ..
A real gem of a little book. The author was witness to life ..